Tuberculosis (TB) has usual pattern but challenging diagnosis in pediatric patients. A ten year old girl with chronic dry cough, anorexia and weight loss since 6 month ago was referred to our hospital emergency department with respiratory distress. In physical exam, she was ill with no fever, but had respiratory distress. Patient was intubated and transferred to Intensive care unit (ICU). Her uncle was deceased from unknown pulmonary disease. Patient had respiratory symptoms from 5 years ago and has been misdiagnosed with interstitial lung disease (ILD). Treatment was started by systemic corticosteroids from 6 month ago. Her symptoms were aggravated afterwards. Acid fast staining (AFB) from gastric aspirate was reported to be positive for Mycobacterium tuberculosis (MTB). Combined anti-TB therapy with 4 drugs was started immediately. Unfortunately patient expired after 36 hours. In conclusion, in pediatric patients, the gastric aspirate is the choice samples for diagnosis of TB. Additionally, molecular or other rapid diagnostic test should take into consideration. Reviewing the family history or close contact cases among pediatric patients it looks mandatory. Tuberculosis, Pulmonary disease, Fatal Outcome. Although tuberculosis (TB) has its usual pattern in pediatric patients; however, its diagnosis is more challenging than adults. Diagnosis and treatment of TB have been improved since last decade and recent advancement in diagnosis technique has integrated into practice by pediatric infectious specialists . The diagnosis of tuberculosis in children remains a difficult one, based only on epidemiologic, clinical, and radiologic findings . The critical requirement for improved accuracy of the diagnosis of tuberculosis in children is well understanding situation and following the current guidelines . We know that examination of sputum smear is the mainstay of TB diagnosis in adults; however, obtaining sputum specimen in children is quite difficult. Usually the diagnostic yield in sputum microscopy in pediatric patients is below 50% . On the other hand, the risk of other respiratory diseases in pediatric with respiratory symptom should take into consideration [4-6]. Among other respiratory disorders the interstitial lung disease (ILD) can be named. The ILD is a group of lung diseases affecting the tissue and space around the air sacs of the lungs  and it mainly concerns alveolar epithelium, pulmonary capillary endothelium, basement membrane, perivascular and perilymphatic tissues. In children, several unique forms of ILD exist which are specific for the young age groups. The acronym "child" is used for this group of diseases and is derived from the English name, Children’s Interstitial Lung Diseases-child . A ten year old girl with chronic dry cough, anorexia and weight loss since 6 month ago was referred to our hospital with respiratory distress. In family history, her uncle was deceased from unknown pulmonary disease. In physical exam, she was ill with no fever. She had respiratory distress and oxygen saturation with pulse oxymetery (SPO2) was decreased to less than 80%. Lung auscultation had diffuse crackles. Thereafter patient was intubated and transferred to ICU. Patient had respiratory symptoms from 5 years ago; that were included dyspnea and a nonproductive cough. The radiological finding showed reduced lung volumes with bilateral reticular or reticulonodular opacities. Although, as the results of smear microscopy from sputum samples was reported to be negative, the patients was diagnosed as interstitial lung disease (ILD) and treated with systemic corticosteroids for 6 months duration. However, her symptoms were aggravated afterwards. The smear examination was performed in peripheral-laboratory in Tehran provinces. Although, after admission to intensive care unit (ICU) in National Institute of Tuberculosis and Lung Diseases (NRITLD), chest XR and other confirmatory test was obtained (Figure 1). Sputum and Gastric aspirate were check for presence of Mycobacterium tuberculosis (MTB). 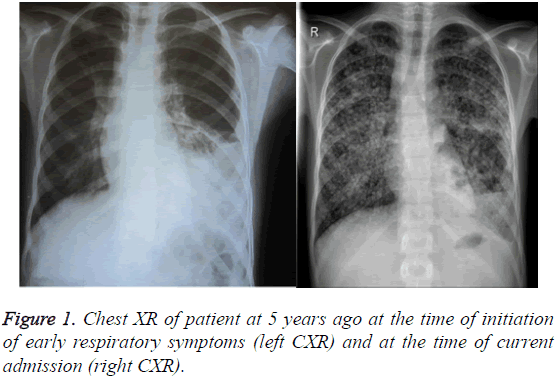 Figure 1: Chest XR of patient at 5 years ago at the time of initiation of early respiratory symptoms (left CXR) and at the time of current admission (right CXR). The smear examination was positive for MTB. Immediately, the anti-TB therapy with 4 drugs was started. Unfortunately patient expired after 36 hours due to severity of her disease and unstable situation. Other laboratory investigations showed leukocytosis and high ESR. Immunoglobulin analysis tests turned out to be all normal in patient and no immune deficiency disorder was recommended for her. Patient had no hemoptysis or no blood dyscrasia. CXR and chest CT of patient are depicted in (Figures 1 and 2). Figure 2: Chest CT of patient 5 years ago. In pediatric patients gastric aspirate smear is the most sensitive test, and should be performed instead of tracheal sputum smear test. In our case, the ILD was diagnosed based on negative sputum smear test for TB. The missed diagnosis resulted in corticosteroid treatment and exacerbation of disease concluded in patient demise. The late detection of TB was due to missed diagnosis in other center in first place. The diagnosis of TB at early stage before dissemination in pediatric group is vital [9,10]. Today, with advances in molecular techniques, i.e., polymerase chain reaction (PCR) and other rapid liquid detection methods, the turn –around for identification and susceptibility testing is reduced to less than 72 hours. Therefore, it is highly recommended that even if such facilities are not available in the peripheral laboratories, the clinicians should send the samples to central laboratories [10,11]. In this case, the diagnosis was overlooked, because the clinician fails to even obtain appropriate family history . Correctly diagnosing TB in children is critical to provide appropriate treatment and for this reasons a doctor should consider all Para clinical and close relative clinical history, before any conclusions . Also since, children with pulmonary tuberculosis are unable to produce sputum, gastric aspirates is the better source of specimens for detection of tubercle bacilli . Already many researchers documented that the gastric aspirate is more suitable and reliable specimens for clinical diagnosis . In an interesting cross-sectional study that conducted on a series of 525 children aged 1 to 15 years, smear and culture of gastric aspirate showed high diagnostic value in children . Of course, radiologic manifestation of TB should not be ignored. Generally, cavity and upper lobe nodular infiltration in CT scan has significant association with TB smear positivity in childhood tuberculosis; while collapse is associated with smear negativity. Besides, the negative smear children most often manifest with primary tuberculosis . In conclusion, in pediatric patients, the gastric aspirate is the choice samples for diagnosis of TB. Additionally, molecular or other rapid diagnostic test should take into consideration. Reviewing the family history or close contact cases among pediatric patients it looks mandatory. Cruz A, Hersh A, Starke J, Beekmann S, Polgreen P, Banerjee R. Controversies in tuberculous infection among pediatric infectious disease specialists in North America. Int J Tuberc Lung Dis 2016; 20: 1463-1468.
de Charnace G, Delacourt C. Diagnostic techniques in paediatric tuberculosis. Paediatr Respir Rev 2001; 2: 120-126. Graham SM, Ahmed T, Amanullah F, Browning R, Cardenas V, Casenghi M. Evaluation of tuberculosis diagnostics in children: 1. Proposed clinical case definitions for classification of intrathoracic tuberculosis disease. Consensus from an expert panel. J Infect Dis 2012; 205: S199-S208. Tiwari S, Nataraj G, Kanade S, Mehta P. Diagnosis of pediatric pulmonary tuberculosis with special reference to polymerase chain reaction based nucleic acid amplification test Int J Mycobacteriol 2015; 4: 48-53. Singhal R, Myneedu VP. Microscopy as a diagnostic tool in pulmonary tuberculosis. Int J Mycobacteriol 2015; 4: 1-6. 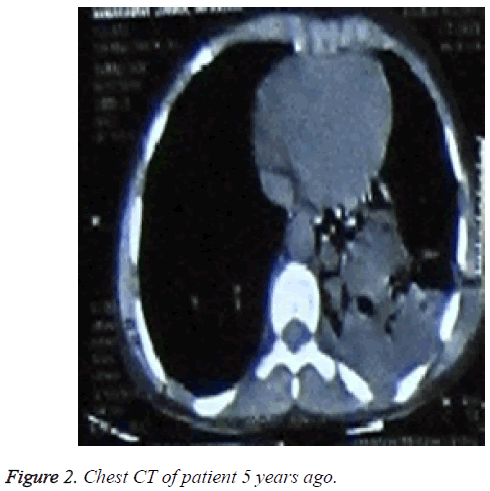 Hasanzad M. Bernard-Soulier Syndrome (BSS) & tuberculosis: A case report. Int J Mycobacteriol 2014; 3: 283-285. King TE Jr. Clinical advances in the diagnosis and therapy of the interstitial lung diseases. Am J Respir Crit Care Med 2005; 172: 268-279. Bush A, Cunningham S, de Blic J, Barbato A, Clement A, Epaud R, Hengst M, Kiper N, Nicholson AG, Wetzke M, Snijders D, Schwerk N, Griese M. European protocols for the diagnosis and initial treatment of interstitial lung disease in children. Child-EU Collaboration Thorax 2015; 70:1078-1084. Bose M, Farnia P, Sharma S, Chattopadhya D, Saha K. Nitric oxide dependent killing of Mycobacterium tuberculosis by human mononuclear phagocytes from patients with active tuberculosis. Int J Immunopathol Pharmacol1999; 12: 69-79. Farnia P, Masjedi MR, Mohammadi F, Tabarsei P, Farnia P, Mohammadzadeh AR. Colorimetric detection of multidrug-resistant or extensively drug-resistant tuberculosis by use of malachite green indicator dye. J Clin Microbiol 2008; 46: 796-799. Kazumi Y, Mitarai S. The evaluation of an identification algorithm for Mycobacterium species using the 16S rRNA coding gene and rpoB . Int J Mycobacteriol 2012; 1: 21-28. Mukherjee A, Singh S, Lodha R, Singh V, Hesseling A, Grewal HM. Ambulatory gastric lavages provide better yields of Mycobacterium tuberculosis than induced sputum in children with intrathoracic tuberculosis. Pediatr Infect Dis J 2013; 32: 1313-1317. Neu N, Saiman L, San Gabriel P, Whittier S, Knirsch C, Ruzal-Shapiro C. Diagnosis of pediatric tuberculosis in the modern era. Pediatr Infect Dis J 1999; 18: 122-126. Pomputius WF, Rost J, Dennehy PH, Carter EJ. Standardization of gastric aspirate technique improves yield in the diagnosis of tuberculosis in children. Pediatr Infect Dis J 1997; 16: 222-226. Khalilzadeh S, Hassanzad M, Baghaiee N, Bloorsaz M, Velayati A. Evaluation of tuberculosis diagnostic criteria in children. African J Microbiol Res 2012; 6: 5440-5444. Bolursaz MR, Mehrian P, Aghahosseini F, Lotfian F, Khalilzadeh S, Baghaie N. Evaluation of the relationship between smear positivity and high-resolution CT findings in children with pulmonary tuberculosis. Pol J Radiol 2014; 79: 120.